Escaping to the Islands and beaches of Baja is the perfect balance of a relaxing and adventurous vacation. As John Steinbeck noted in his Log From the Sea of Cortez, there is a whole world teaming with life just under the surface of the turquoise waters. Hot sun baked beaches frame the salty sea of Cortez, the landing zone for the fun to come. 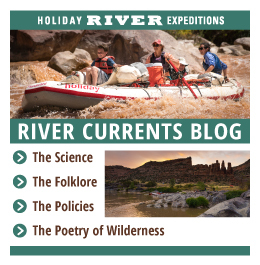 With countless ways to play; from Sea Kayaking to fishing, cultural exploration to snorkeling; these expeditions are the ultimate beach vacation without the crowds. It’s not everyday you get to measure your frame against a sea-lion or stand awestruck by a blue whale. For the more reserved, some well deserved beach relaxation is never a bad option. No matter which length or area you choose to explore around this world-class coastline, you will find rich and abundant life both in and out of the water. 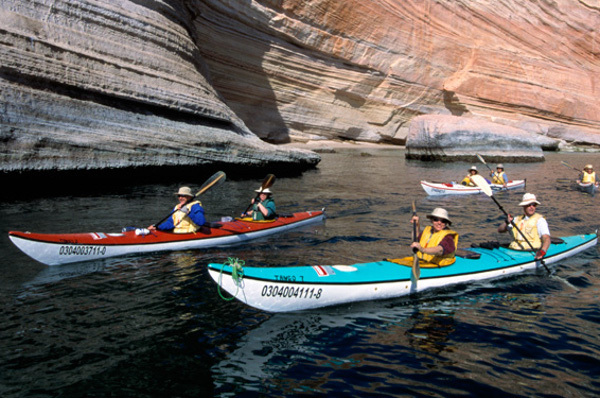 Our Espiritu Santo Island Circumnavigation Trip is the quintessential, classic Baja sea kayaking trip for paddlers looking for a challenging kayaking experience and wanting to get a glimpse of this island’s spectacular east coast. This desert island paradise has over 20 white sand beaches with shallow bays of turquoise waters gently sloping toward giant cactus along the west coast and towering cliffs dropping into deep, blue waters along the east coast. 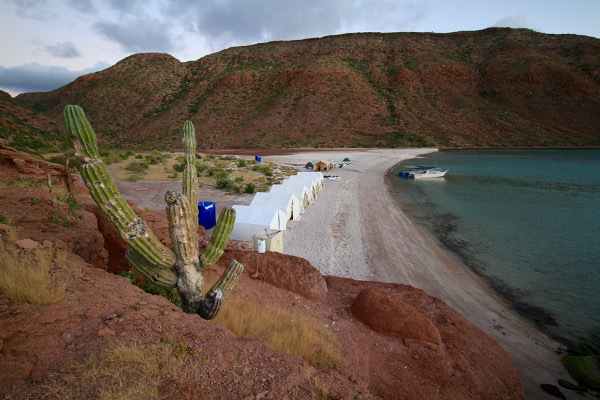 Have you ever dreamed of exploring the desert islands that dot the Sea of Cortez? 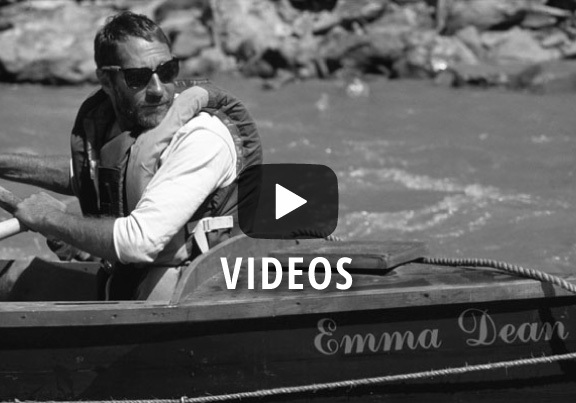 Exploring their uninhabited shores and wildlife-rich waters? Well this trip can take you there! 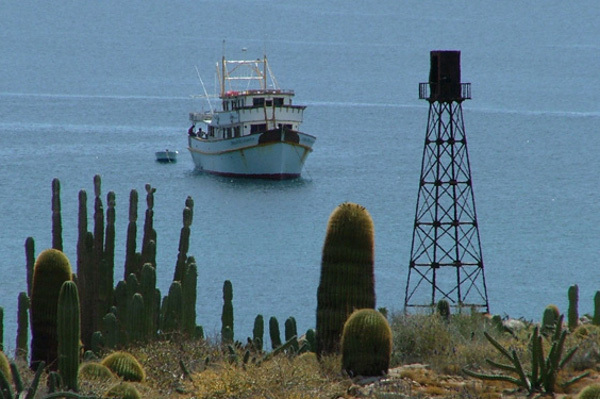 We’ll camp on five and visit more than 10 different islands as we travel between La Paz and Loreto. Travel from island to island will be via motorized boats while exploration of the islands will be by kayak, snorkel and on foot. 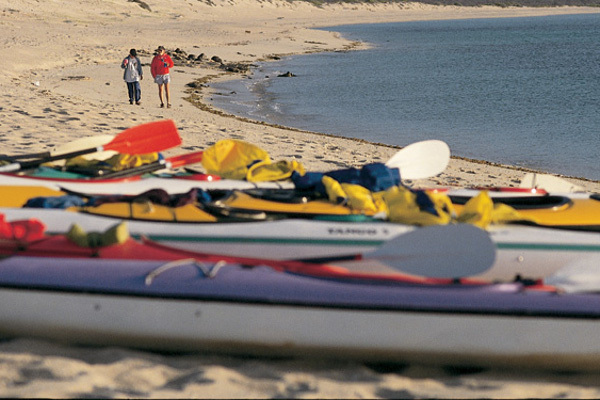 This is the perfect escape for the enthusiastic sea kayaker seeking the pace and feel of a true vacation. This remote section of the Baja coastline is a paddler’s dream, offering unique scenic beauty combined with abundant wildlife viewed from above and below the water’s surface. 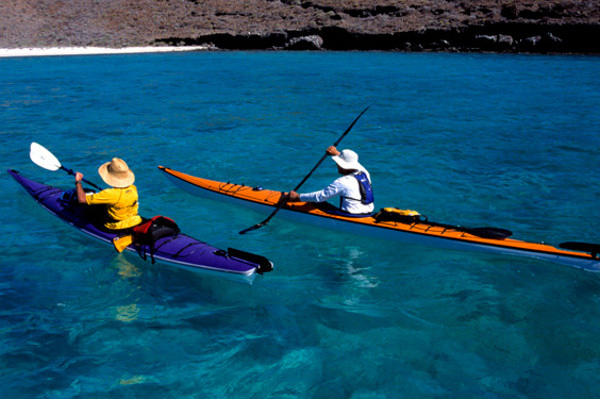 The Sea of Cortez presents optimal paddling conditions in the fall and spring. Enjoy the warm (80 degrees F) waters in fall for snorkeling to your heart’s content. Spring trips are characterized by warm, calm days and possible encounters with migrating whales. 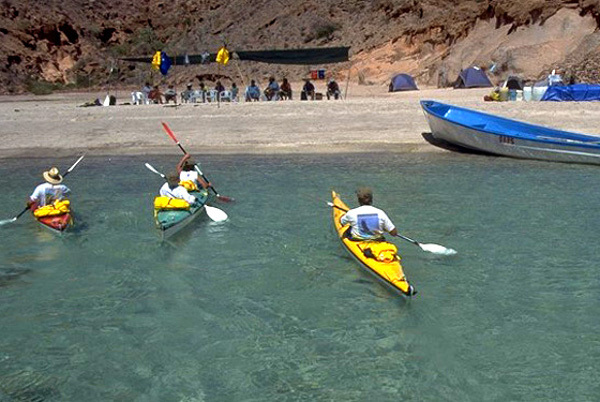 The kayaking portion of this trip is spent exploring the beautiful island of Espiritu Santo in the Sea of Cortez. 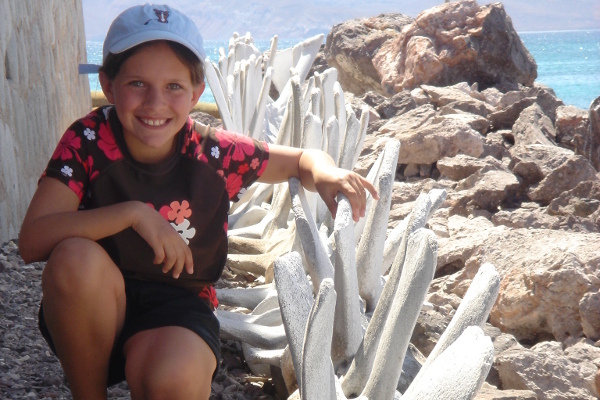 The other half of the trip offers close encounters with the Pacific gray whales in Magdalena Bay on the Pacific coast of Baja. 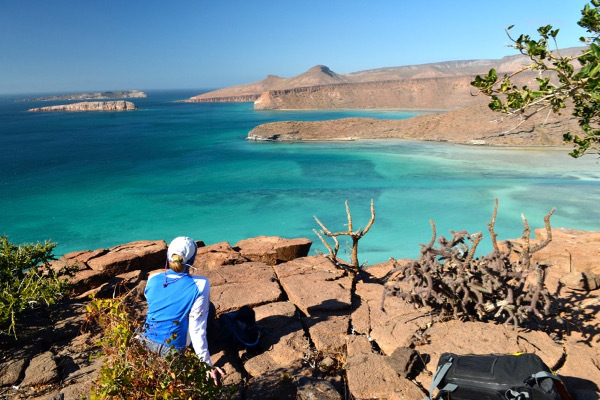 Kayaking from our base camp on Espiritu Santo Island allows us the opportunity to explore beautiful white sand beaches, canyons adorned with hanging fig trees, boulder up arroyos, and snorkel among friendly sea lions and tropical fish. 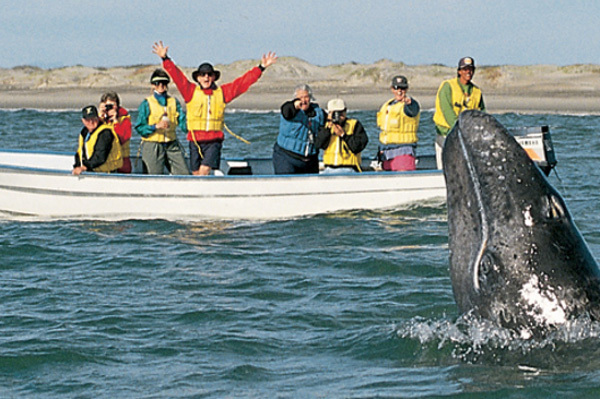 In Magdalena Bay, daily excursions into the bay provide close encounters with the magnificent and friendly gray whale. 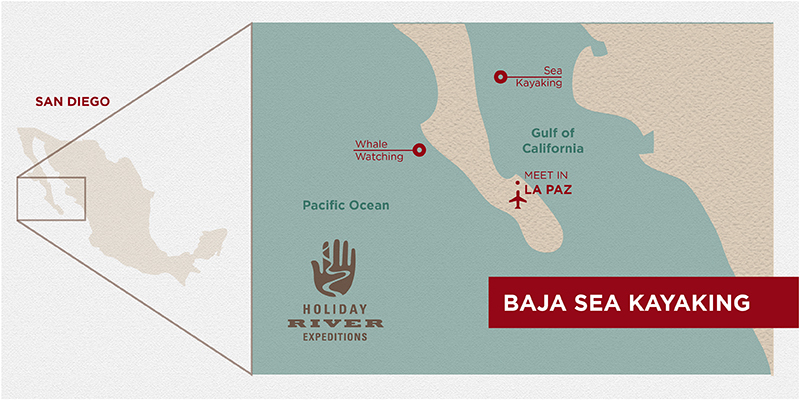 Winter in Baja presents the perfect opportunity to combine Baja’s spectacular paddling and snorkeling in wildlife abundant waters with some culinary and hiking exploration of a remote eco-ranch set deep in the nearby sierra. 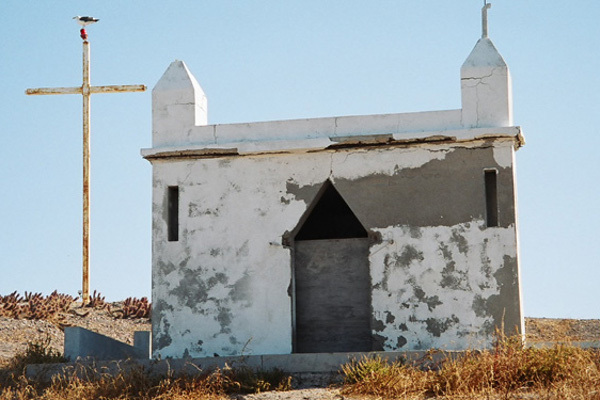 On this “best of” journey we’ll bring you to both spectacular coasts of Baja including the beautiful Espiritu Santo Island in the Sea of Cortez and remote, wild shores of Magdalena Bay on the Pacific Coast.